On 30 October 2011, it was exactly ten years ago that the Convention on Access to information, Public Participation in Decision-making and Access to Justice in Environmental Matters, signed by representatives of 35 States and the European Community at a pan-European ministerial conference in the Danish city of Aarhus in 1998, entered into force. This multilateral treaty, negotiated under the auspices of the UN Economic Commission for Europe, represents the most comprehensive and ambitious effort to establish international legal standards in the field of citizens’ environmental rights to date. Though some of these standards were inspired by earlier EU environmental legislation, many provisions of the Aarhus Convention went beyond the rights already guaranteed by the EU and compelled the European Commission to propose new legislative acts, most of which were adopted between 2003 and 2006, to bring EU environmental law up to the Convention’s standards. Since its adoption over a decade ago, the Aarhus Convention, which now has 44 Contracting Parties in Europe, Central Asia and the Caucasus region, has had a considerable impact on national systems of environmental law and administrative practices in many countries of Europe and beyond, as well as on the law and institutions of the European Union and even in other international organisations and fora. The contributions assembled in this book focus on various aspects of the relationship between the provisions of the Convention and the development of EU environmental law. They discuss the new legislative acts and amendments to existing legislation adopted by the EU institutions since 2003 in order to implement the Aarhus Convention, on such matters as access to environmental information and public participation as well as access to justice in respect of environmental impact assessment, strategic environmental assessment and integrated pollution prevention and control in EU Member States. The relevant legislation also includes a regulation organising the application of the procedural rights guaranteed by the Aarhus Convention at the level of EU institutions and bodies. Other contributions address tensions that have arisen between normative developments within the framework of the Aarhus Convention and the internal legislation and policies of the EU. These concern contentious issues such as general access to justice in environmental matters – for which the Commission unsuccessfully proposed legislation to guarantee a minimum level of access to review procedures for environmental groups in the Member States – and judicial review by EU courts of acts and omissions of EU institutions. Another area of tension discussed in this volume concerns public participation in product-related regulatory decisions with respect to genetically modified organisms and chemicals. Together, the various contributions to this volume address synergies and conflicts across the three ‘pillars’ of the Aarhus Convention and examine the broader legal and institutional implications of these interactions for the development of both EU law and international environmental law. 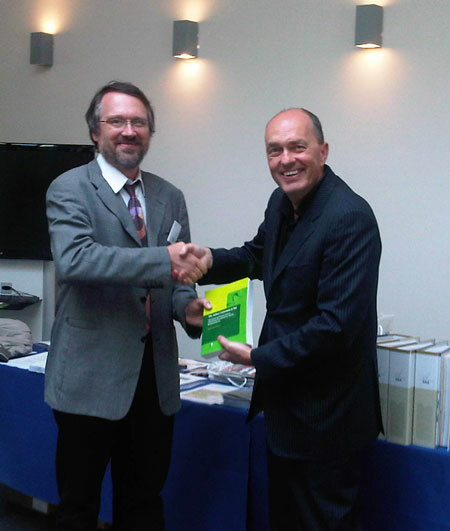 The first copy of the book was presented to Prof. Pallemaerts on behalf of the publisher and the Avosetta Group by Prof. Jan H. Jans on 6 June 2011.